Our Food Services Department works daily to provide nutritious, wholesome meals that students enjoy eating. All our meals meet the standards set by the U.S. Department of Agriculture. We understand that proper nutrition is a key component in academic performance, and we want all our students to have the energy they need for success. We serve breakfast and lunch on a daily basis. 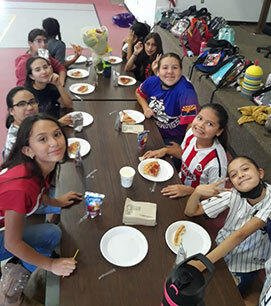 Nogales Unified School District #1 will be providing free meals during the summer for children 18 years of age and under. Meals will be available at different locations throughout Nogales during the months of May, June, July, and August. Please see the information below for additional details. “Mom, I’m starving!” Is this what you hear every afternoon as soon as your child is in the car or walks in the door? You begin to wonder if your child is eating all of his or her lunch. Understanding your child’s schedule will help you realize why the word “starving” is so commonly used. Many children eat lunch as early as 10:30 a.m.! They still have afternoon classes and possibly recess before they will have another opportunity to eat. Some children may even have an after-school activity that keeps them busy until 4:00 p.m. or later. Think about your child’s schedule and plan accordingly. If you pick up your child from school, bring a snack along for the ride home. If your child rides the bus, have a designated place – maybe the kitchen table or island – with an after-school snack waiting. For children with an after-school activity, pack an extra snack with their lunch. Place a homemade fruit or vegetable tray on the table while you are preparing dinner. Remember to choose snacks that are low in sugar, fat, and salt. Be creative. Fruit and cheese kabobs, yogurt pops, and smoothies are all wonderful, healthy ideas. Parents.com and FamilyEducation.com are great resources for healthy snacks. Let your child be involved in choosing which snacks he or she will like best. Plan and prepare together for some extra bonding time. Experiment and discover what works best for your family. We provide free or reduced price meals for children who qualify under the U.S. Department of Agriculture guidelines. Visit our office for application information.